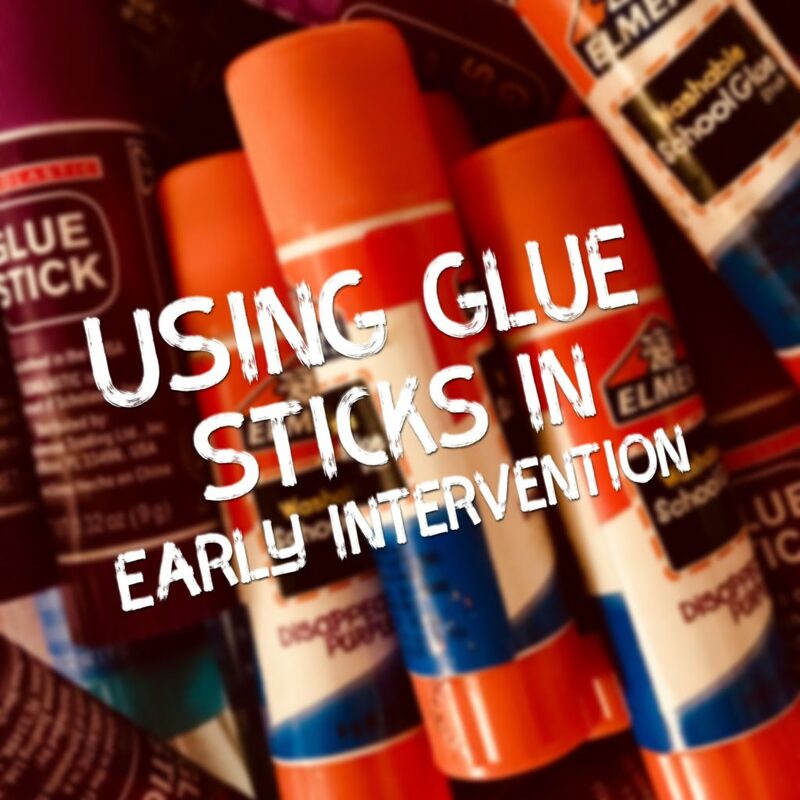 The inspiration for this post about glue sticks in early intervention comes from helping the children’s church ministry. I noticed a bucket of glue sticks that were passed around to the children–including caps! My first instinct was shock and horror. It took me a second to realize that obviously these 5-12 year olds were old enough to be trusted with the caps to the glue sticks. My instinct to keep the caps away comes from my toddler classroom days where they were not only a choking hazards, but also a hidden teaching opportunity. Glue sticks are awesome for early intervention. Using glue sticks make it possible for a toddler to do some sort of art activity without making an incredible mess. I love giving a toddler scraps of colorful paper and a glue stick and see what happens. Tear several colors of paper in small bits or allow the child to help you tear the paper too. Start gluing. 1. Can he figure out the sticky end goes on paper? Is he using it functionally to glue paper? Or eating it. 2. If he tries to use the wrong side on paper or if you hand it to him that way, does he self-correct? Problem solving skills right there. 3. Can he figure out how to use one hand to hold the paper still with the other hand using the glue stick? 3. Watch and listen for communication. Any spontaneous words? Gestures? Imitation? 5. Observe grasp and strength. Is he using his fist or a tripod grasp? 6. If he wants to trade glue sticks? How does he ask? When you give a child or a group of children glue sticks in the beginning, don’t give them the caps. Keep them put up and away. For one thing, a glue stick cap either regular or jumbo is a choking hazard. For another thing, I HATE not being able to put the cap back one because we can’t find it. Make putting the cap back on a social interaction routine. When the gluing is done, and it is time to put the glue stick away, bring the caps out one at a time as the child hands you his glue stick, make putting the cap back on together an intentional teaching activity. You can directly supervise the choking hazard cap this way and reinforce many more skills simply in the interaction routine of putting the cap back on together. Create the routine that he comes to you when glue time is over to get his cap, then put it on together. 2. Compare the grasp on the cap to the child’s grasp of the larger stick. Refer to your child’s age for what is a developmentally appropriate grasp at each stage. Palmar, digital etc. 3. With cap in one hand and glue stick in the other, can your child match the cap to the stick? That is hand eye coordination! 4. Do they have the arm strength to push the cap and glue together to get it to close? It’s not easy, but trying is a strengthening exercise in itself. 5. Can they imitate words or sounds or signs you model? You can request the child say or sign “glue” or “all done” before you let them handle the cap. 6. Joint attention, back and forth communication, and eye contact are things you may be trying to work on. Putting the cap on the glue stick creates a social opportunity to practice those skills. 7. Was there some sticky glue on their fingers? There should be at least some. If not, why not? If so, how does he handle it? Freak out and wiping? 10. At some point in this process, the child is going to need some help. Whether wiping sticky off his hands, getting the cap, needing more paper, wanting help getting the cap on or closed. When he needs help, how does he ask for it?